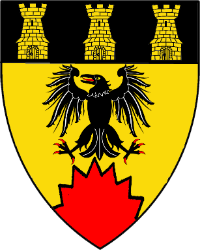 Or, a raven displayed sable and a mount indented gules, on a chief sable three towers Or. Name registered with the College of Arms in December 1992. Device registered with the College of Arms in December 1992.